Tiny biological robots that walk to the beat of a thin sheet of rat heart cells have been created by US scientists. 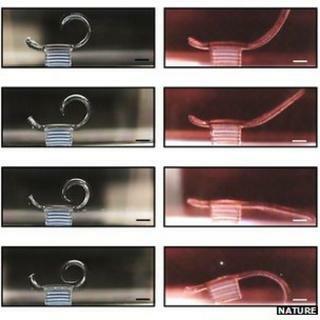 The "bio-bots" were fabricated using a 3D printer and then seeded with the cardiac cells. The regular twitching motion of the heart cells makes the tiny structure flex and slowly inch along. The project could lead to bio-bots with different shapes, seeded with all sorts of cells, that find a role in medicine or as sensors, said the researchers. The 7mm long bio-bots were fabricated at the University of Illinois at Urbana-Champaign and resemble a diving board. They have one long leg supported towards one end by a broad stumpy foot. A 3D printing process was used to build up layers to form the board and foot of the bio-bot from hydrogel - a biologically inert goo often used in tissue engineering work. A separate procedure was used to coat the underside of the long board with a single sheet of living rat cardiac cells. When the heart cells twitch in unison they make the long board curl and act as a lever to push the bio-bot a tiny distance forward. The bio-bot's top speed has been clocked at about 1mm every four seconds. Prof Rashid Bashir, who led the research at the University of Illinois, said the team's tiny bio-bots could find a role as sensors or in environmental reclamation projects. "Our goal is to see if we can get this thing to move toward chemical gradients, so we could eventually design something that can look for a specific toxin and then try to neutralise it," said Prof Bashir in a statement. "Now you can think about a sensor that's moving and constantly sampling and doing something useful, in medicine and the environment." The research team is now making bio-bots of many shapes to find other ways for them to move and coating them with different types of cells to give them new abilities. They could be seeded with nerve cells or light-sensitive cells to give them more control over where they went. "We have the design rules to make these millimetre-scale shapes and different physical architectures, which hasn't been done with this level of control," said Prof Bashir. "What we want to do now is add more functionality to it." A paper describing the Illinois research appeared in Nature's Scientific Reports.